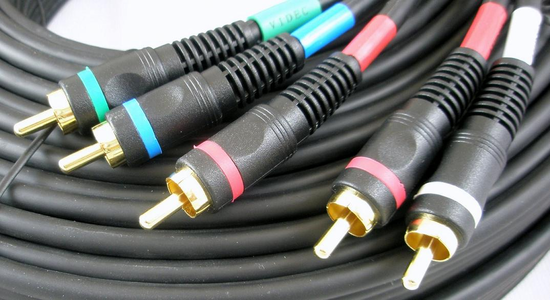 Component Video with Stereo Audio RCA Cables are a great choice for connecting your high-definition DVD player and high-end television. These cost conscious cables are of higher quality than most standard component video cables giving you a crisp, clear picture and audio for less. The coax conductor's foil and copper braid shield helps reduce unwanted noise and distortion. 24K gold-plated heavy-duty connectors ensure long lasting, corrosion-free connections to your equipment. The color-coded connectors attach to an ultra-flexible jacket allowing for easy installation and identification. By using Component Video Cables, you bypass the TV�s Y/C separator and Color Decoder, routing the color (Y Pr Pb ) information directly into the TVs matrix decoder. By sending the pure DVD component video signal directly to a component video input-equipped display device, the DVD signal forgoes the extra processing that normally would degrade the image. The result is vastly increased image quality, with incredibly lifelike colors and crisp detail. The attached Left/Right Analog Audio cables help complete the connection for a simple solution.